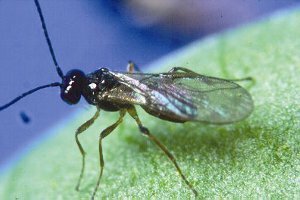 These parasitic wasps lay their eggs within the Leafminer larvae. The young parasitic larvae then hatches internally and begins to devour the leafminer from the inside out. Then a new parasite emerges to continue feeding on additional leafminers.